Every member’s voice deserves to be heard, especially on issues that impact their jobs and their families. UFCW Local 663 is helping its members speak out in support of a new bill that strengthens economic opportunities for communities across Minnesota. 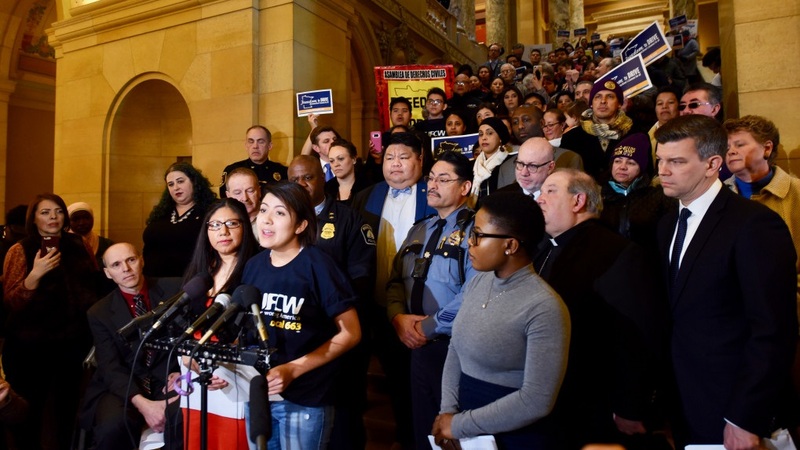 The bill is H.F. 1500, the License Access and Public Safety Act, which will open up a road of opportunity not only for our members, but for all workers in the state of Minnesota. On Feb. 21, UFCW Local 663 and Freedom to Drive MN coalition partners joined Minnesota House Majority Leader Ryan Winkler at the state capitol in St. Paul, Minn., in support of this bill, which would expand eligibility for obtaining a driver’s license or Minnesota identification card to include all members of the workforce. Veronica Orellana, a student from Worthington, Minn., and the daughter of UFCW Local 663 member José Orellana, shared what this bill would mean for her family. UFCW Local 663 is one of the leaders of the Freedom to Drive MN coalition, which includes nonprofit organizations, other unions, community advocates, faith-based organizations, workers’ rights advocates and local businesses. In coordination with the International’s Legislative and Political Action Department, UFCW locals are holding lobby days at their state legislatures to protect the rights of our members and all workers in their respective states. 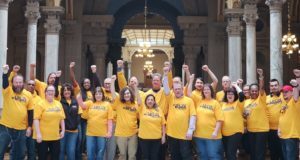 UFCW Locals 75 and 227 are taking a stand against an anti-worker insurance bill, which is moving in both chambers of the Kentucky State Legislature (HB 317 and SB 171). This legislation would cut the amount of a worker’s weekly unemployment insurance benefits by 25 percent every five weeks. This legislation would also cut the number of weeks that a worker could receive these benefits from 26 to 20 weeks, which would have an adverse effect on Kentuckians who live in economically distressed communities and need more time to find a suitable new job. In February, both locals also lobbied together in support of another piece of legislation to protect workers in the state–the Kentucky Pregnant Workers Act (SB 18), which would require employers to provide reasonable accommodations for pregnant employees, including more frequent or longer breaks, time off to recover from childbirth or a temporary transfer to less strenuous duties. UFCW Local 227 also joined together with UFCW Local 700 in a day of action at the Indiana State Legislature last month in support of similar legislation–the Pregnant Workers’ Bill of Rights. This legislation has been introduced in both chambers (HB 1073 and SB 590) and would prohibit an employer from discriminating against a pregnant job applicant or employee. This legislation would also require an employer to provide reasonable employment accommodations for a pregnant employee, including giving them breaks from sitting or standing for long hours and helping them avoid chemicals, radiation, or other hazardous substances. If your local is interested in coordinating a lobby day with the International’s Legislative and Political Action Department, contact your region’s political point person in the department. If you are unsure who that is, reach out to Political Director Karen Gasper at kgasper@ufcw.org.